Whiplash is the generic term commonly used to describe a neck injury caused by a rapid jerk or ‘whip-like’ forward, backward, sideways or rotational motion of the head, however the term refers to the mechanism of injury (how it occurs) rather than the injury itself. Other non-medical terms for this type of injury include neck sprain and neck strain. The neck itself is a continuation of the spine beyond the torso and it is commonly and correctly referred to as the ‘cervical spine’ (or sometimes as the ‘c-spine’). The term ‘cervical’ is used to describe anything pertaining to the neck, but also somewhat confusingly to any other neck-like structure within the human body – notably the neck of the uterus or womb – or the cervix as it is better known. When a whiplash injury occurs, the neck is placed under immense strain for a very short period of time, and this can cause damage to cervical muscles, discs, vertebrae, intervertebral joints, nerves, ligaments and tendons. In the majority of cases the damage is minor and will heal within a matter of 6-10 weeks but in some cases it can be more acute and can take significantly longer to resolve. The term ‘chronic neck pain’ is defined as neck pain that lasts in excess of 6 months. Whiplash injuries can occur in many different scenarios, although by far the most common and familiar scenario is a car accident in which the occupant’s vehicle is struck from the rear by another vehicle travelling at a much higher relative speed – for example, a stationary vehicle being unexpectedly hit from behind at a set of traffic lights by another vehicle that has failed to stop. Around a quarter of a million motorists in the UK alone suffer whiplash injuries each year and a small percentage are permenantly affected. Other situations that commonly result in whiplash injury include falls from horses and motorcycles, skiing-related injuries and those sustained through contact sports such as rugby, boxing or martial arts, or any activity that may result in sudden impact to the head, including assaults, slips and falls. Whiplash injuries can also be caused by repeated actions in the longer term, such as holding a telephone against your ear by pressing your head toward your shoulder. Cervical Extension or Cervical Hyperextension – left-hand image below (where the neck is stretched by the head being thrown backward in relation to the rest of the body) – this name is derived from the fact that the soft tissues within the cervical spine (neck) are stretched or extended beyond their normal limits when the head is forced rapidly into this position. Cervical Flexion or Cervical Hyperflexion – right-hand image below (where the neck is stretched by the head being thrown forward in relation to the rest of the body) – this name is derived from the cervical spine (neck) joints stretching or flexing beyond normal limits – as the chin is forced down towards the chest the vertebrae are pulled apart. The term ‘acute’ may on occasion be added to the above terminology to denote a particularly serious occurrence of it. Whiplash is often more serious when the sudden movement is not directly forwards or backward, or where the neck is not straight when the impact is sustained, since the neck is less capable of dealing with extremes of movement under these circumstances. 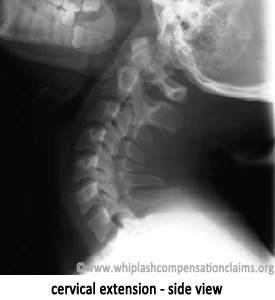 Side impacts, or those involving sudden rotation of the head and neck often result in more serious cases. 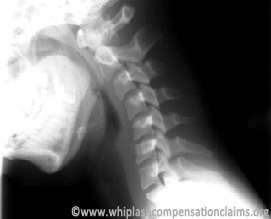 Whiplash is also generally more severe when the impact is unexpected –as you are not able to brace yourself for the impact and thereby lessen any potential movement of the head in relation to the rest of the body. Impact sustained from behind while looking to one side can result in more complex and painful whiplash injury. In the case of road traffic accidents, a significant size and weight difference between the vehicles involved is also a factor. Where a small vehicle is struck from the rear by a larger vehicle it will accelerate more rapidly and therefore there is an increased risk of a more serious injury.